Economics Spring Graduation Recognition Event will be on Thursday, May 9 at 5:30pm at the Madison Masonic Center. Students must arrive by 5:00pm. This event is designed to honor all of our economics graduates: Bachelor’s, Master’s, and PhD. We will hold a formal ceremony at 5:30pm with a reception following the ceremony at the same venue. Students will receive an invitation via email in March and should RSVP through the survey included in the invitation by April 19. You can email your questions to alissa.wilson@wisc.edu and we will respond promptly. Where and when is the economics graduation event? 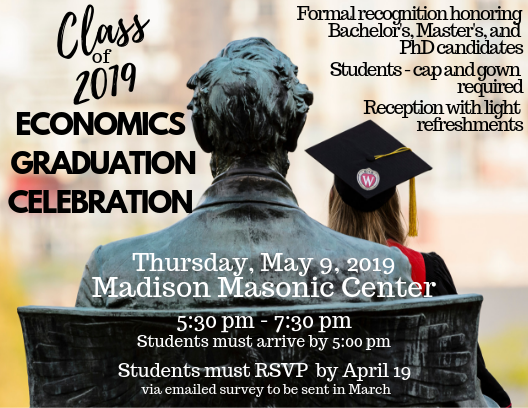 The Department of Economics Graduation Event is Thursday, May 9, 2019 at the Madison Masonic Center, 301 Wisconsin Avenue, Madison, Wisconsin, 53703. Doors open at 4:30pm; the event begins at 5:30pm. Graduates must arrive by 5:00pm to ensure the event starts on time. How is the economics event different from the UW-Madison commencement at Camp Randall Stadium? The Department of Economics event is a formal recognition event. During the event, graduating economics students at all levels will walk across the stage, have their name read, shake hands with department leaders, and have a graduation photo taken. The campus-level Camp Randall Commencement event is for UW-Madison bachelor’s and master’s candidates and is on Saturday, May 11, 2019 at 12pm. Chancellor Blank will confer degrees and recognize graduates by program; however, they will not have personal recognition or walk across a stage. The UW-Madison ceremony for doctoral and professional degree candidates is May 10, 2018 at 5:30pm at the Kohl Center. Tickets are not required, but we do require that all students who intend to participate in the economics graduation register through their invitation email. Students will indicate the number of guests they intend to bring during the registration as well. Is there a limit to the number of guests allowed? We ask that students limit their guest count to no more than 3 people. If students would like to bring additional guests, information will be collected through the RSVP and students will be notified of additional guest availability by April 26, 2019. The ceremony itself will begin at 5:30pm and conclude at approximately 6:45pm. There will be a reception immediately following at the same location. What happens at the reception? Will the event be videotaped or live-streamed? No; however, your family and friends are welcome to photograph and/or videotape. Will graduates’ names be read at this ceremony? Yes. We will recognize all graduates individually as they walk across the stage. Bachelor candidates will receive a certificate folder on stage. Master’s and PhD candidates will be hooded by their advisor on stage. Will graduates’ names be in a printed program? If you have applied for graduation through your student center in MyUW, we will include you in the Department of Economics Graduation printed program, provided you do not have FERPA restrictions on the release of your information. How do I know whether I have a FERPA restriction on my information? You can locate this information in your student center in MyUW. Go into your student center, click “personal information,” then click the “privacy” tab. Click FERPA restrictions, scroll down to “names.” If there is nothing written next to “names,” you do not have a FERPA restriction on the release of your name. If you see “restriction activated,” your name will not be included in our printed program. To release the name restriction, click the release button, then press save at the bottom of the screen. How can I get a seat for someone with mobility challengs? 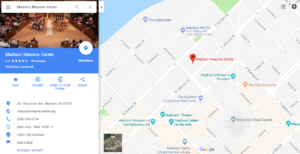 Street-level entry to the Madison Masonic Center is available via the Johnson Street entrance. Accessible seating is available in the auditorium and the graduating student will need to indicate on his or her registration form if this type of seating is needed. For people with limited mobility, the first two rows off the floor level are “easier-access” seating and will be sectioned off for those in need. Who can participate in the economics graduation event? Students who are graduating with a Bachelor’s, Master’s, or PhD in economics are welcome to participate. Students who have completed degree requirements in May 2019 or who anticipate completing degree requirements in August 2019 may participate. How do I indicate I’m planning to participate in the economics event? Students will receive invitations via email with a registration link attached. What should I wear for the economics event? Students are required to wear their cap and gown for the ceremony. View the University Book Store’s timeline for ordering a cap and gown to ensure your attire arrives on time. Master’s and PhD students should refer to emails from Graduate Coordinators for further information on ceremony attire. Will I walk across the stage at the economics ceremony? Yes, students will walk across the stage in the company of students from your degree level. Undergraduate students will receive a certificate folder on stage. Master’s and PhD students will be hooded by their faculty advisor. Master’s and PhD students should refer to emails from Graduate Coordinators for further information on the hooding process. Will I have my photo taken? Yes, Empire Photography will be taking photos of each student as they walk across the stage. Proofs will be available for viewing online within a couple days of the event. We encourage family/friends to take photos of the event for you as well. When should I arrive at the Masonic Center? The venue will be open at 4:30pm and all graduates must arrive by 5:00pm. What happens if I can’t or don’t attend the economics event? Your attendance is completely voluntary; the university will mail your diploma several weeks after commencement and choosing to bypass any graduation event will not affect your graduation status. The Department does encourage all of our students to participate. The Economics Graduation Celebration will be held at the Madison Masonic Center located at 301 Wisconsin Ave, Madison, Wi 53703. The center is located at the corner of Wisconsin Ave and E. Johnson St. The handicap accessible entrance is located via the E. Johnson Street side of the building. Parking ramps are located just a couple blocks away from the venue. Street parking will be limited, but is available on a first-come, first-served basis. Graduating students should pay particular attention to the “Information for Graduates” page as it has instructions on how to apply to graduate, how to reserve your cap and gown, and details about which ceremony you should attend.